State Sen. Daniel Biss speaks at the Buffett Center on Monday night. 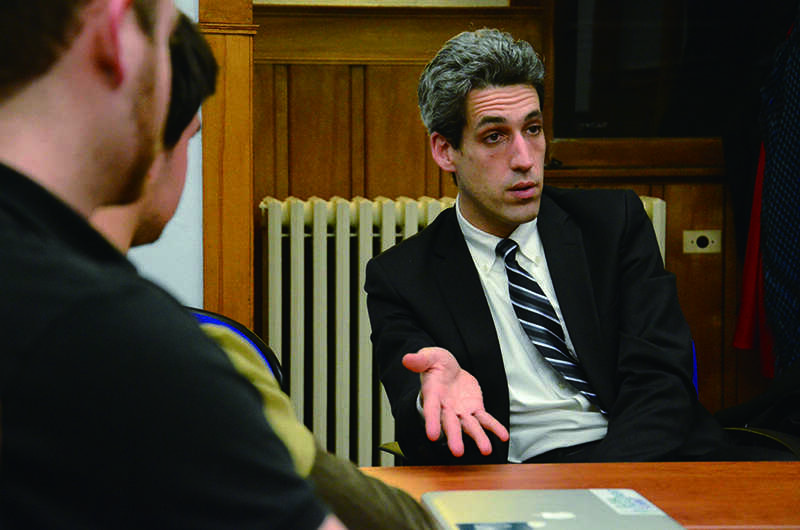 Biss spent the majority of the event answering students' questions and talking about the pension crisis, the process of running a political campaign and his beliefs on an individual's role in democracy. State Sen. Daniel Biss (D-Evanston) spoke at Northwestern on Monday about his political background and Illinois fiscal issues. The event, which brought about 15 people to the Roberta Buffett Center, was hosted by the Northwestern University Political Union. The senator, who has been at the forefront of efforts to reform Illinois public pensions, held a discussion about various budgetary issues. Building a road in Illinois costs more than building a road in other states that have better credit ratings and lower interest rates. Consequently, any time there is a proposition to spend tax dollars, that proposition becomes less attractive for taxpayers, Biss said. Biss, who represents Chicago’s northern suburbs including Evanston, grew up in Indiana, before attending Harvard University and the Massachusetts Institute of Technology, earning his undergraduate degree and his doctorate, respectively, in mathematics. He was a faculty member of the mathematics department at the University of Chicago prior to running for office. To start the talk, Biss spoke about his history as a politician. He first ran for a seat as a state representative in 2008 but lost that election. He then won the next election in 2010. After his term ended in 2012, he ran to become a state senator, winning with more than 66 percent of the vote. Biss spoke about what he learned from these elections and the importance of focus and organization when running a campaign. In a district with more than 50,000 voters, Biss said it was important to connect with the electorate. Weinberg junior Connor Tatooles, co-president of the Political Union, said Biss sparked an interesting discussion. “Biss offers a unique perspective given his educational background,” Tatooles said. Weinberg senior Samuel Ide, a member of the group, said it was important for the group to host Biss.